About the commuter train terminal and transportation hub in Northern Warsaw. This station is a bit out of the way for most people but for the fact that the Warsaw Metro stops under the station. Because of that, it is now a major communications hub where people come into Warsaw using the light rail system and get onto the Metro and head into the center. At the station there are also tram links and bus links - east and west and north and south. You can buy tickets for the trains that services station on the trains themselves. It is probably best, however to go into the main station Hall to look at the schedule so that you can increase your chances of getting on the right train. Here is a link to the page related to the Metro station that is under this railway station. 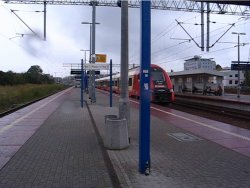 As a side note, there are many freight trains that use this station as they bypass Warsaw. The video to the left gives you an overview of the station. And it has a contact link that you can use if you have any questions or need any personal help. .How to link your video can be found in the video at the end where there is a special link. We hope this page on the Warsaw Gdansk Station has been helpful. If you need any other information or have any other information that we should add, please contact us.